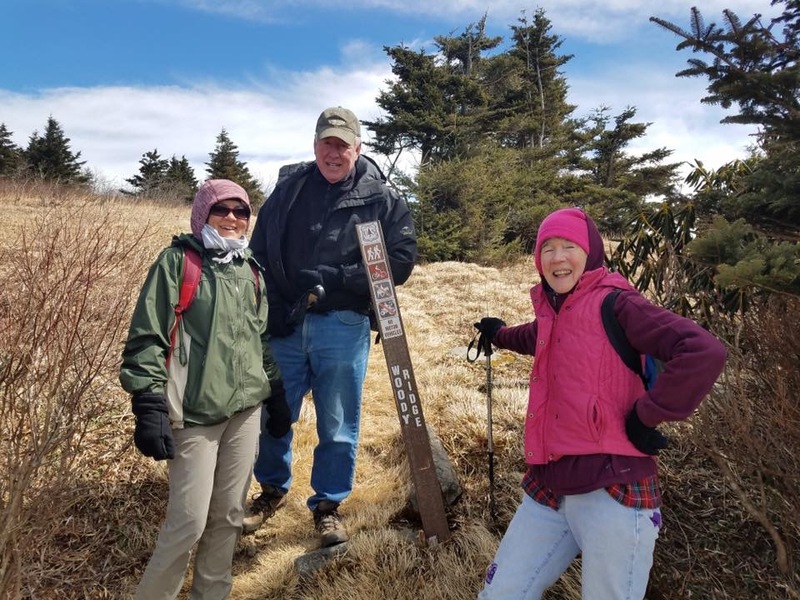 Retired physician David Cort didn’t even know where the monthly High Peaks Trail Association’s hike was planned when at church he asked long-time hike leader Dennis Smith if he could join the group’s March 16 outing. To his surprise, the hike was one of the club’s longest and hardest of the year – a climb of nearly 4,000 feet up the Woody Ridge Trail to the crest of the Black Mountains, and then down the Bolen’s Creek Trail for a distance of nearly 9 miles. Cort’s stamina and determination impressed Smith. Joining Smith and Cort on the hike were Jenny Boyd Bull and Gail Pace. The Woody Ridge track includes a couple of scrambles on sheer rock faces, one so steep it requires a rope attached to a tree for assistance. The outing was made even tougher by the weather – temperatures in the 20s and howling winds of 30 to 40 mph – along with patches of ice in the trail. Cort has lived in Burnsville for decades and practiced as an Internal Medicine specialist and also as an Emergency Room physician in Spruce Pine. His wife, Carolyn – who passed away three years ago – was a pediatrician known and loved by many Yancey and Mitchell families. The family took occasional hikes and camped a few times in the Great Smokey Mountains, but were not avid hikers. Cort said he cuts firewood and walks his dog to stay in shape now, but might need more conditioning in advance if he attacks the Woody Ridge Trail again. Smith said most High Peaks hikes are not so challenging, and he hopes more people might join the club on some of its outings. Photo info: Photo by Dennis Smith. Retired physician David Cort, center, with Gail Pace, left and Jennie Boyd Bull, right, on the Crest of the Black Mountains after climbing the challenging Woody Ridge Trail.